Why are there different views about the influence of media on the course of Vietnam war? Why are there different views about the influence of media on the course of war? 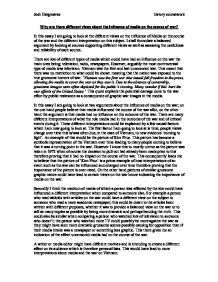 In this essay I am going to look at the different views on the influence of Media on the course of the war and the different interpretation on this subject. I shall formulate a balanced argument by looking at sources supporting different views as well as assessing the usefulness and reliability of each source. There are lots of different types of media which could have had an influence on the war the main ones being; television, radio, newspapers. However, arguably the most controversial type of media was television. Vietnam was the first and last uncensored war. This meant that there was no restriction to what could be shown meaning that the nation was exposed to the true gruesome horrors of war. 'Vietnam was the first war that issued full freedom to the press, allowing the media to cover the war as they saw it. Due to the absence of censorship, gruesome images were often depicted for the public's viewing. Many wonder if this hurt the war efforts of the United States.' This quote explains the potential damage done to the war effort by public resistance as a consequence of graphic war images in the media. In this essay I am going to look at two arguments about the influence of media on the war; on the one hand people believe that media influenced the course of the war allot, on the other hand the argument is that media had no influence on the outcome of the war. There are many different interpretations of what the role media had in the outcome of the war and of critical events during it. These different interpretations could be explained by a few causal factors which I am now going to look at. The first factor I am going to look at is time; people views change over time this is/was often due, in the case of Vietnam, to new evidence 'coming to light'. ...read more. being made was great and would have had a big affect on the course of the war, as to try and stay in power the government would have to support the public. I know this source was written by Daniel ford after he had carried out research on the impact of media on the war. This therefore makes this source useful and entirely relevant to what I am investigating as it was written for the same purpose; to find out what the influence of media was on the war. However this source could also be unreliable and I must be sceptical of his motives; he was a novelist and could have used this article as a way of achieving fame by putting forward controversial ideas in the hope of making money. Furthermore, in the source he mentions that veterans were surveyed about what impact they thought media had on the war; it is not stated what questions were asked and how many people were surveyed therefore adding to the possible unreliability of the source. Moreover I must question whether the veterans were the best people to carry out the survey upon, as they most likely would have served throughout the war meaning they would not know how much the public opinion was influenced, and not being in America hence they would most likely not have a true indication of what effect media did have on the war; also the opinion of a veteran of how much influence media had on the course of the war could also be bias due to them having served in the military and wanting to pin the blame somewhere else. It is also questionable whether a soldier would know if there was any change to the public attitude towards the war veterans after 'Mai Lai' if they were in Vietnam when the incident happened. However on the other hand the fact that the publics' attitude was bad indicates how much war opposition there was which obviously must have obviously been a cause of something. ...read more. As well as this it does not include any results of any kind which makes me unsure of the source's reliability. However on the other hand these two men were well respected in their field which gives the report more credibility and adds to its reliability. 64% said television shad made them feel like backing up the boys in Vietnam. 26% felt moved to oppose the war. This quote infers that media did not influence the course of the war. In fact it states television was more likely to increase support towards the war. I question the reliability of this source as I am aware that nearly half the population apposed the war in 1067. Two years later Nixon was voted into power as he promised to bring an end to the war further adding to the unreliability of the source as it is in contradiction of the majority of the public being opposed to the war and wanting to bring it to an end. Furthermore this source does not include how big the sample size was and what people were asked meaning that it could easily be biased. However from looking at source L I can see that it 'suggests that the media had a greater impact on the middle, upper-middle, and upper classes in regard to change in attitude toward the Vietnam War than it did on the lower classes.' This therefore possibly infers, if this were to be considered accurate, that the survey taken in source R could be of lower class people, who as the source states, were less likely to be affected by the media. The research of source L was done in 1982 which is still time enough to be affected by factors over time and therefore could possibly make source L reliable. Moreover this survey was taken just before the horrors of the Mai Lai massacre which many people considering a turning point in the war. Source L therefore does not give an accurate representation of what effect the ?? ?? ?? ?? 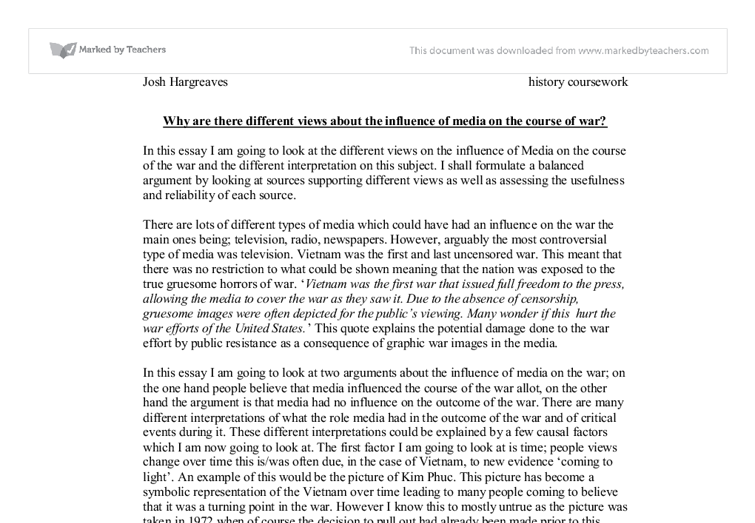 Josh Hargreaves history coursework ...read more. This student written piece of work is one of many that can be found in our GCSE Vietnam 1954-1975 section. Did the power of television force the US to leave Vietnam? On March 8, 1965, thirty-five hundred American Marines landed at the city of Da Nang, these were the first U.S. combat troops sent to Vietnam. During the month of April in 1965, President Johnson authorized U.S. military personnel in Vietnam to undertake offensives in support of ARVN operations. American History Research Paper: Was Entering The Vietnam War A Good Idea? The war officially ended in 1974 when the North Vietnamese took control of South Vietnam and made the entire country communist governed (Brownell 5). They may have been communist in the end, but much of the surrounding countries remained democratic (Welch 98). The train is called US economy. Coming out of the steam on the train is the word Vietnam. This shows that the US economy was feeding the money for the great society into Vietnam, to provide funds for the war. The money got fed into Vietnam because President Truman had promised to put funds into the war and promised America's commitment, so they couldn't back out. How important was the role of the media during the Vietnam War? The media conveyed the campaign very effectively. An important man part of the media during the war was Walter Cronkite. He was one of few people who were reporting the Vietnam War in Vietnam. Cronkite came to cover the aftermath of the Tet Offensive. Cronkite was invited to dine with General Creighton Abrams, the current commander of all forces in Vietnam. Did The United States Lose On The Vietnam War Home front Or Battlefield?